Here, reprinted for the first time since its original publication, is muckraking journalist Upton Sinclair's lively, caustic account of the 1934 election campaign that turned California upside down and almost won him the governor's mansion. 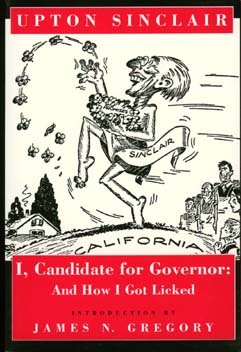 Using his "End Poverty in California" movement (more commonly called EPIC) as a springboard, Sinclair ran for governor as a Democrat, equipped with a bold plan to end the Depression in California by taking over idle land and factories and turning them into cooperative ventures for the unemployed. To his surprise, thousands rallied to the idea, converting what he had assumed would be another of his utopian schemes into a mass political movement of extraordinary dimensions. With a loosely knit organization of hundreds of local EPIC clubs, Sinclair overwhelmed the moderate Democratic opposition to capture the primary election. When it came to the general election, however, his opposition employed highly effective campaign tactics: overwhelming media hostility, vicious red-baiting and voter intimidation, high-priced dirty tricks. The result was a resounding defeat in November. I, Candidate tells the story of Sinclair's campaign while also capturing the turbulent political mood of the 1930s. Employing his trademark muckraking style, Sinclair exposes the conspiracies of power that ensured big-money control over the media and other powerful institutions. Upton Sinclair (1878-1968), novelist and journalist, is best known for his novel about the Chicago meatpacking industry, The Jungle. James N. Gregory is Professor of History at the Univesrity of Washington and author of American Exodus: The Dust Bowl Migration and Okie Culture in California.